I'm really nervous about writing this one. I love blogging, but I find that the more you put yourself out there the more you open yourself up to some really harsh criticism. 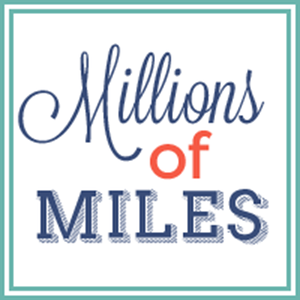 I've said before that after Miles had been home for four months, I, along with my doctor, made the decision to go on antidepressants. I could have used them much sooner. I went straight from probably needing a xanax to help me chill out during the adoption process to needing antidepressants in a heartbeat. I'm not ashamed of that. It was completely necessary for me. When you give birth to a baby, all the baby books tell you about getting the baby blues. You get that flood of hormones leaving the body, you're sleep deprived and you have a tiny baby that probably does a lot of crying. Of course you are going to get the baby blues! It's pretty much just a matter of to what degree. After giving birth to our first, I was a little hormonal for about 2 weeks. Mostly I just cried a lot for no reason, but got over it rather quickly. After giving birth to our second child, I felt off for nearly a year. I went straight from the baby blues to full on depression. Unfortunately, I didn't fully recognize just how bad it was and I was so ashamed that I wasn't insanely joyful about a new baby that I suffered in silence. It was a really strange feeling to me. I always considered myself to be a pretty happy and upbeat kind of gal. A close family member of mine had struggled with depression for years, even to the point of having a nervous breakdown and I just didn't get it. I couldn't figure out why this person just couldn't make up their mind to be happy. I fed right into all those quotes about how you could just choose to be happy. And to some extent, one can, but depression is a whole other ballgame. So when I found myself unable to just will myself out of my post baby funk, I got really down on myself. I mean, here I was, blessed beyond all measure and I just wanted to sit in a room and cry all day. I would listen to my sweet baby crying and instead of wanting to jump up and go comfort him, I would just feel angry. I feel certain that if I had just gone to talk to someone or told my doctor about how I was feeling, that I wouldn't have suffered so long with postpartum depression. Ahhh, hindsight. So imagine my surprise when we adopted kiddo number three and my body and mind still got all wonky. I was thinking that eliminating the prospect of postpartum depression was going to be one of the best perks in choosing to adopt. 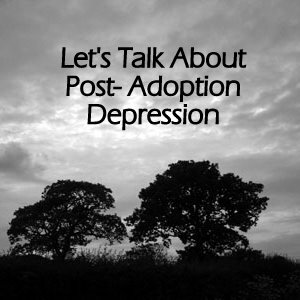 I had heard of post adoption depression, but honestly, I thought that it was just something that people made up to explain a hard transition home. In the process I never once gave any thought to it, our social worker never said a word about it, and none of the people that I knew who had adopted ever said a word about it. But not long after stepping off the plane with our new son, BAM! It hit me like a ton of bricks. Those first few days with Miles felt like love at first sight. But a few weeks after getting him home and we began to learn more about him, he became a stranger to me. I tried hard to bring back those lovey dovey feelings I had when I first laid eyes on him, but for a long time it felt like I was pouring love into someone else's child. He was someone else's child. All through the process, I kept looking at his picture and calling him my child. While he was "my child" he was also someone else's child. Here I was, looking at this toddler, and wondering what in the hell I was supposed to feel. In reality, I felt more bonded to his referral picture than the actual child. I loved him. I truly did. But I'm not sure that I liked him. When we began to see crazy behaviors coming from this stranger, I lost it. It was like an outsider came into my house and disrupted the whole balance. My other children, my marriage, my sense of self- it all suffered. I tried to just pull myself and my emotions together, but I couldn't do it. I felt angry, disappointed, overwhelmed, alone, ashamed, inadequate, unprepared and desperate. I was supposed to be this great champion of orphans- yet in my own home I couldn't muster up the understanding that was needed to parent my own former orphan. What did that make me? I felt like a monster. Everything I thought I knew about the person that I was was ripped to shreds. I so wanted to feel towards our adopted child the way that I did about the children I gave birth to. I told God, my social worker, our family and friends, that we would love this child just like our homegrown children and I felt like I was failing. I read all the books, googled the heck out of post adoption depression and reached out to a few friends. When my biological children would do something really bad, I had years and years of happy memories with them to pull from to balance out their indiscretions. But when our adopted son would pull the exact same stunts, I had nothing to draw from. There were no happy memories of him cooing as a baby and taking his first steps to tip the balance. I felt so angry all the time. I felt jipped. I felt jealous of all the babies coming home that just seemed to fit so perfectly into their new homes. Their moms didn't feel on edge and panicky all the time- so why was I? I grieved for my adopted son. He came with his own history and his own personality that I in no way helped to mold and that felt weird. He came home very sick and all the time at doctor's offices and hospitals took me away from my other children and I was angry about that. I was trying to come to terms with all that I saw in Africa and I was beyond devastated and unable to process how I felt about the poverty there. I needed help, but found that all the people who want to cook meals and coo over a tiny baby don't beat down your door when you adopt a toddler. I wanted to reach out to my husband but felt like I couldn't. After all- I pushed for us to adopt and felt like I'd get a big "I told you so" even though my sweet husband would never ever say or even think that. I suppose I was really telling myself a big ol' "I told you so." I thought about calling our social worker, but I was seriously afraid that they would take my new son away and I would have a big red X on my file should we decide that we ever wanted to adopt again. I kept trying to muster up the happiness, and it was there in glimpses, but I just couldn't pull myself out of the depths. I could tell myself that I had a reason for feeling how I was feeling, and could tell my brain some steps to take to work through it, but it was like my head was rebelling against logic. The only logic I could understand was that I was being completely illogical. I could tell myself, that if I just gave it time, that this child would begin to feel like my child and we'd make happy memories, and we'd find our groove as a family but my head would not stop screaming, "NOPE! YOU ARE GOING TO FEEL MISERABLE FOREVER!" After about four months of feeling so out of sorts, I finally went and talked to my doctor. I sat in her office bawling. 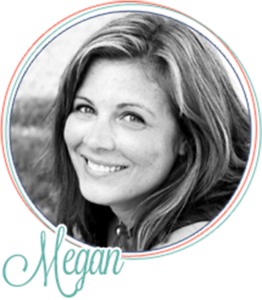 She said, "Megan, you do realize that everything you are feeling is completely situational, right? You thought you were getting a baby and you end up with a toddler. You now have two boys with their own sets of special needs. You jumped from two children to three. You are overwhelmed and tired. Of course, you feel crazy! But you're not crazy. You are normal. You are dealing with a lot and it would stress out anybody who was trying to do what you are doing." I wanted to walk across the room and kiss her. Finally, someone said, "Hey, it's okay to feel what you feel. You don't have to feel love at first sight for this child to be your son. You can grow to love him and that is alright. You can give yourself time to adjust and life will still go on. It doesn't mean you are a bad person." She and I decided together, that even though everything I was going through was purely situational (meaning that I wasn't chemically or hormonally imbalanced or anything) that the best thing for me to do was to start some antidepressants. She explained to me that it would help me feel like I could reason better and respond more appropriately to the tasks I needed to do to get through each day. I don't think that that is the answer for everyone, but for me it was absolutely the right decision. After about four weeks, I began to finally feel like myself again. I could reason. I could function. I could set more realistic expectations for what this journey would look like. I could see light at the end of the tunnel. I could tell myself that I would figure this thing out and I actually believed myself. ...From another adoptive mom that is STRUGGLING through PAD, PLEASE tell me that the meds truly did help. I just started meds yesterday. I know it takes a while for it to take effect, but I need the HOPE! Because it is SO dark right now. Right now I only have the strength to cry out to you in desperation because I'm pretty sure you took meds for PAD too, and I need to hear that it helps!! I feel for her. You can hear the desperation. I've been where she's been. You can tell that she is fighting with herself to not feel how she's feeling. But that's the tricky thing with depression. It defies all logic. It's like your own brain is pulling a great trick on itself. The weird thing is that you know it is happening yet you feel so powerless to do anything about it. After opening up over the summer about having to go on medication, I got a lot of these kinds of emails. It happens more than you think, even if no one talks about it. The good news is that it does get better. For me, it required medication and time- lots of time. Waaaay more time than I wanted it to take. Our son has been home for almost a year (holy cow!) and he doesn't feel like a stranger anymore. We do have happy memories to draw from. He IS one of us. I cut myself some slack and realized that becoming a family doesn't have to happen overnight. It will eventually happen. There is no time table. For some, it is instant, for others- it takes a while. Either way, there is NO reason to feel guilty over how quickly it happens. We don't expect our children to adjust overnight. You can't expect that for yourself, either. You do the best you can. You wake up and do it again the next day, and the day after that and the day after that. And eventually, one day you wake up and realize that you don't have to try with all your might to make your family feel like a family because by golly- you're THERE! Rome wasn't built in a day, and neither are families. Amen.